Superb door at an unbelievably low price! Unlike lower quality doors which are available on-line which are often secured by small latch clips and cables these doors feature a Night Latch and large, strong top and bottom shoot bolts on the inside which lock into the floor and frame top. 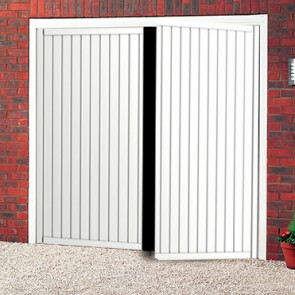 This helps prevents forced entry by kicking the doors inwards as well as pulling them open. Please note: Sizes shown are displayed as (Width x Height) and frame sizes are not included in these measurements. All our garage doors, unless otherwise stated, come complete with lock/handle/fitting pack and full instructions. If you are unsure or need help on sizing up, please do call our sales team, they will be more than happy to help you.